Polycarbonates (PC) are very strong elastic plastics that have been used extensively for many years to make daily utensils. However, according to scientific research, polycarbonates contain Bisphenol A (BPA), which is a hazardous pollutant to the environment and to human health. Two Indian scientists, Professor Mukesh Doble and research scholar Trishul Artham, invented an advanced technology to disintegrate polycarbonate plastics. The process involves pre-treatment with ultra-violet light and heat as well as exposing the plastics to three fungi. Using the chemicals already in the plastic as a source of energy, the fungi can decompose the PC plastics effectively within 12 months without releasing any harmful BPA. 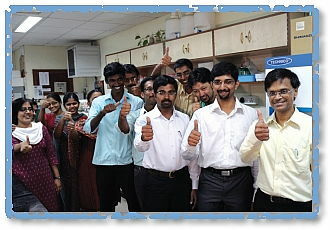 Staff in the Biotechnology Laboratory share the joy of the Award with the recipients. Supreme Master Ching Hai acknowledged this outstanding invention by granting Professor Mukesh Doble and Mr. Trishul Artham the Shinning World Inventor Award. 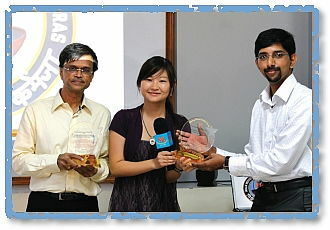 Our Association members travelled to the Indian Institute of Technology in Chennai, India, on June 9, Golden Year 7 (2010) to make the presentation. In the Biotechnology Laboratory, the two scientists shared the joy of this special occasion with 25 of their colleagues. Professor Doble said that he felt very honored to receive this Award, and was grateful to Supreme Master Ching Hai for recognizing their work. He believes that this will encourage more inventors to dedicate their efforts to safeguarding the planet; and hopes that this Award will help raise people’s awareness to protect the environment, thus creating a more beautiful and sustainable world for ourselves and for generations to come. Our grateful salutation to Professor Mukesh Doble and Mr. Trishul Artham for their love and wisdom in developing this green technology which enables all beings to enjoy better health and a cleaner environment.